This CD contains all previously unreleased material, recorded in 1972, just prior to Bruce Springsteen's meteoric rise to international stardom. These songs are the type of material that record company executives had heard, to recognize what would soon be "The future of Rock and Roll." 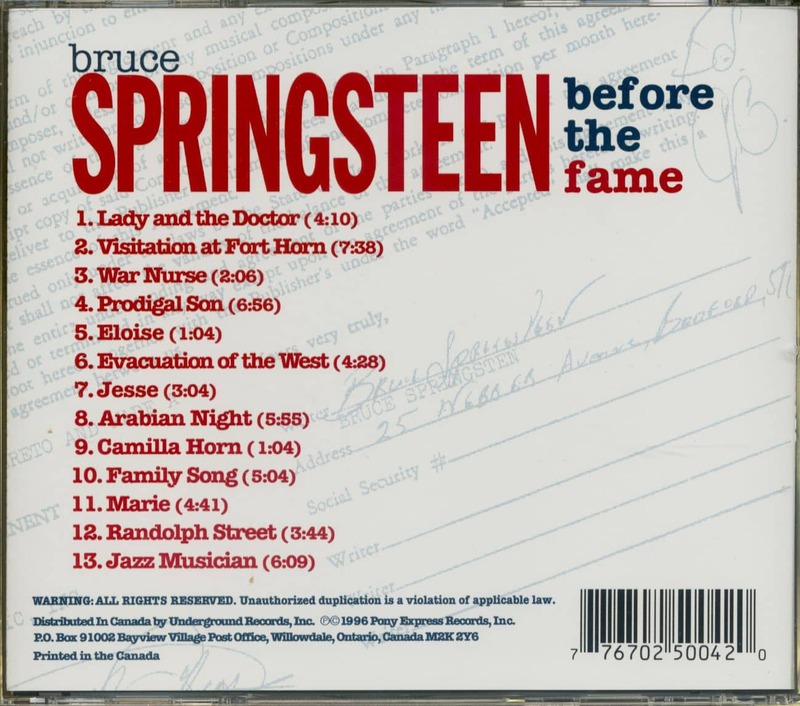 All of the tracks give insight to the true, raw poet, and it is to this style that Bruce has recently returned. 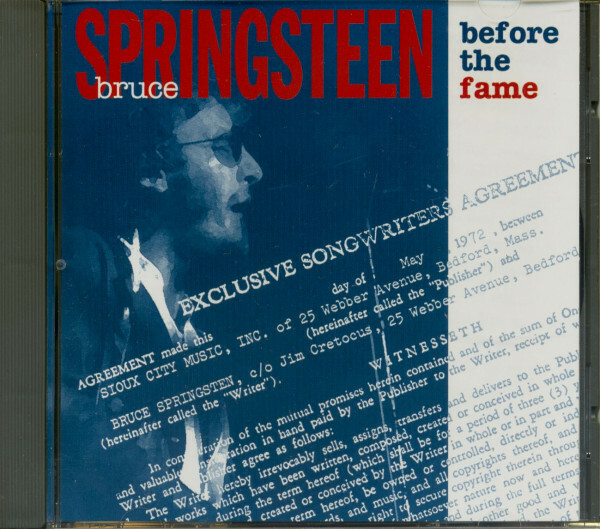 This rare release invites you to listen to Bruce Springsteen "before the fame, but not before the genius." He has been called the "last innocent in rock," which is at best partly true, but that is how he appears to audiences who are exhausted and on fire at the end of a concert. Springsteen is not a golden California boy or glitter queen from Britain. Dressed usually in leather jacket and shredded undershirt, he is a glorified gutter rat from a dying New Jersey resort town who walks with an easy swagger that is part residual stage presence, part boardwalk braggadocio. ...His music is primal, directly in touch with all the impulses of wild humor and glancing melancholy, street tragedy and punk anarchy that have made rock the distinctive voice of a generation. ...Springsteen's songs are full of echoes-of Sam Cooke and Elvis Presley, of Chuck Berry, Roy Orbison and Buddy Holly. 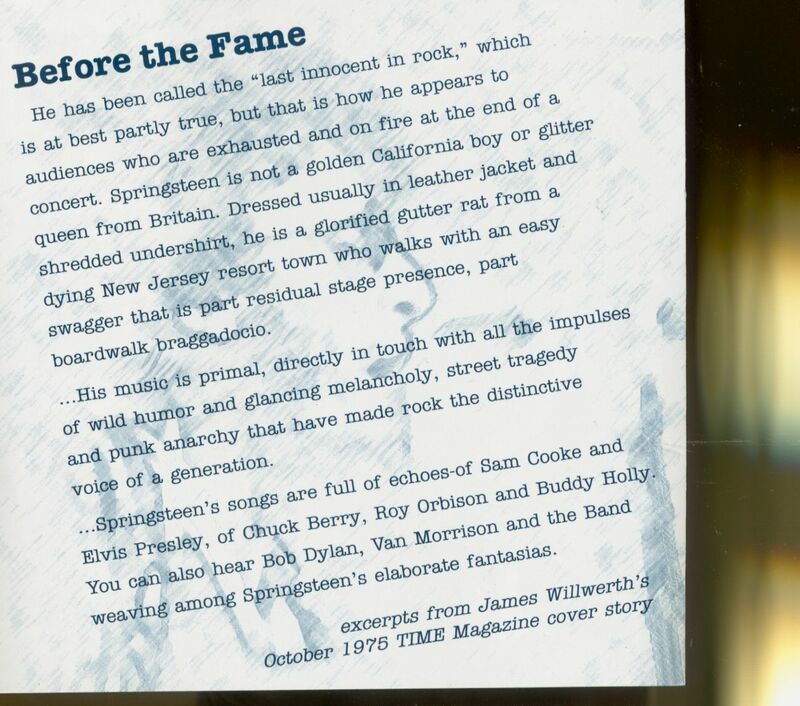 You can also hear Bob Dylan, Van Morrison and the Band weaving among Springsteen's elaborate fantasias. Customer evaluation for "Before The Fame (CD)"